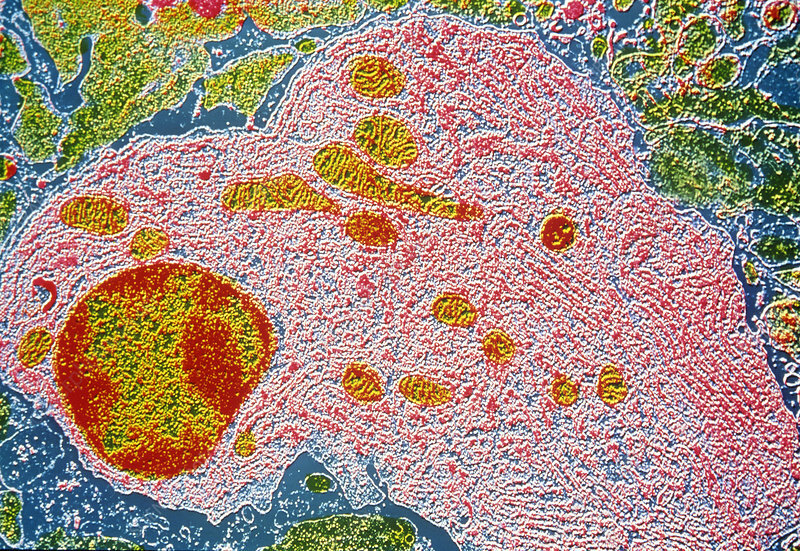 False-colour transmission electron micrograph (TEM) of a human plasmocyte. Plasmocytes are mature B-lymphocytes (white blood cells) that synthesize & secrete the antibodies of the immune system. Characteristic of a plasma cell is the parallel array of the rough endoplasmic reticulum, (red, at left), the cisternae (elements) of which become dilated with antibodies (immunoglobulins). Antibodies produced by a single plasma cell are of one specificity and immunoglobulin class. Another typical feature is the quantity of heterochromatin (red) which adheres to the inner nuclear membrane x2,800 at 35mm size.